Today is much like every other day in the Central African Republic (CAR). Life continues its simple rhythm following the annual cycle of seasons. Slowly we are changing from the dry season to the rainy season. Everyone here is a farmer and now is the time I can watch them planting crops. They burn the field, turn over the soil by hand with a homemade hoe, and plant. Then like farmers everywhere, they wait and hope for just the right amount of rain. I know that the dusty dirt roads will soon be replaced with mud, but no one knows when. Family life continues inside and around the traditional mud brick houses in the village. The daily meal is cooked over an open fire. Women and children fetch water every day and carry it home on their heads. Most people get water from springs, which at this time of the year are barely more than mud holes. In a few places where there is a relatively clear trickle of water and then there is a line of people waiting with their buckets. It takes a long time to fill a 5 gallon container from a small trickle one cup at a time. Parents send their children to wait in line. Most children do not go to school. Three out of four girls are kept at home to help with the chores, such as fetching water. Water-borne diseases are common. Those who can afford it, go to the hospital where seeing the nurse costs about 25 cents and prescriptions for diarrhea, worms, or malaria are filled for only a dollar or two. Unfortunately not everyone can afford even these modest fees. PASE (the water management project that I work with) teaches hygiene and sanitation to villagers. We improve water sources and repair wells. We do simple, sustainable projects to improve the lives of people that live in this part of the CAR. People often ask me, what they can do to help. One of the things I tell them is to be informed. Read. Mail is slow here and I have not yet received my April 2010 issue of National Geographic. But many people have e-mailed me that it is a special issue devoted entirely to water. It talks about accessibility, purity, and the impact of climate change. I have heard that it talks of the work of my colleagues in Water Aid (a British NGO) that are working in Ethiopia and elsewhere. We do not celebrate Earth Day here, but I would like to ask you to celebrate Earth Day by informing yourself about the many water issues that the world is facing. Please think about those less fortunate than yourself. Think about the futures of the children that never go to school because they spend the day fetching water. 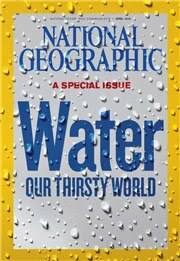 Photo is of the April 2010 Cover of National Geographic.